I feel really lucky to be surrounded by some special women in my life who are expecting or just had a little one. This is a great time for Jess because it means there are lots of babies to snuggle and play auntie to. While I think soaking in all this cuteness is fantastic – I’ve learned what really makes for a happy babe is a happy home and happy mama. Yoga can certainly help women throughout the course of their pregnancy by reducing stress, providing muscle release, strengthening the body to prepare for childbirth, establishing a deeper connection with their growing baby, and developing a thoughtful practice linking movement with breath. A woman becomes very much aware of her body when she is pregnant and it is important to practice in a mindful manner. Each person is different, so if you are expecting, I strongly suggest consulting with your doctor before diving into your yoga practice (especially if you have not practiced yoga before). My girlfriends often complain of their list of pregnancy don’ts, but if you are thinking about practicing yoga – I’m going to add a few considerations to the mix. If don’t regularly practice yoga, perhaps during your pregnancy is not the time to start. That being said, some gentle and restorative postures can still provide the benefits of yoga while practicing in a way that safely protects your body. Avoid bouncing or jumping in your flow. Steer clear of lying on the stomach and doing back bends or inverted postures. Of course all “rules” in life seem to have exceptions. That being said, Adho Mukha Svanasana (Downward-Facing Dog) can be a safe and beneficial asana for an expecting mother and the same with Setu Bandha Sarvangasana (Bridge). Do not practice abdominal twisting motions as this can squeeze the midsection and change the position of the little yogi or yogini. Practice balance postures with experienced partners or next to a wall to help provide support. You could be the greatest athlete in the world, but your body is changing and your weight is distributed in ways you are not used to, so please take caution. Asanas placing pressure on the abdomen or stretching the abdominal muscles are best to be skipped during this time. This is a heated topic in the yoga world (pun intended), but many expecting mothers ask if they can practice hot yoga during their pregnancy. I have not been pregnant myself, but through my teachers and friends – this is the response I suggest: If you are conditioned and regularly practice yoga in a heated room, then avoid the hot temperatures during your first trimester. Try the heat during your second trimester, but make modifications to have an easier practice and see how you feel. If you do not regularly practice yoga in a heated environment – avoid it through the duration of your pregnancy. Your body is not conditioned to this atmosphere and the goal is to create a safe environment for you and your baby. Ok, I know reading a giant list of what you should not be doing isn’t super fun, but knowledge is power. Now lets get to the stuff pregnant mamas CAN do and enjoy! Marjaryasana (Cat) / Bitilasana (Cow) flow is helpful to sync the breath to movement. Know that this is different from regular Cat/Cow flow. 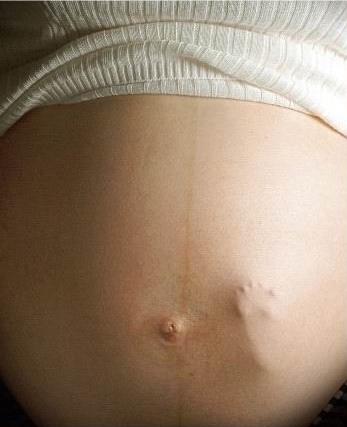 When you are pregnant, isolate your lower tailbone and pulse your pelvis. Inhale to drop the pelvis forward and exhale to arch the pelvis with a slight rounded back. Doing these daily throughout your pregnancy helps to tone the lower back and abdomen, takes pressure off the bladder, helps with digestion and aligns the baby correctly. Virabhadrasana II (Warrior II) can increase leg strength and help open the hips. This asana also encourages focus and connection to breath. Baddha Konasana (Bound Angle), with the soles of your feet together and the knees moving away from each other, or Malasana (Squat) can increase blood circulation to the pelvic floor. Balasana (Child’s Pose) helps to decrease stress and fatigue while gently stretching the hips and thighs. When expecting, take knees as wide as the mat and sink to the ground. This asana helps relieve back and neck pain. Vrksasana (Tree) should be practiced next to a wall to help create balance and the foot can be placed on the ankle or inner thigh pending flexibility. Vrksasana strengthens thighs, calves and ankles while stretching the groins, inner thighs, chest and shoulders. This posture also relieves sciatica. Savasana (Corpse) should be modified by laying on the left side with pillows for props. Arguably the most important asana, Savasana helps relieve stress, relaxes the body, encourages sleep and lowers blood pressure. Tags: baby, expecting, mom, pregnant, prenatal, prenatal yoga. Bookmark the permalink.